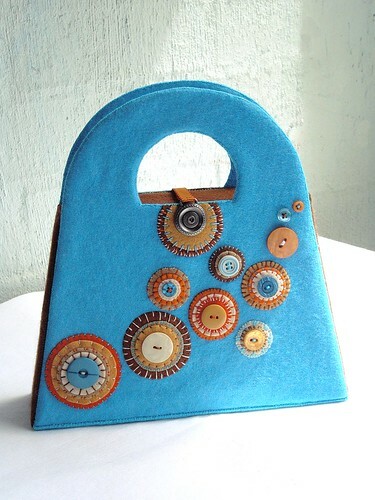 A hard sided handbag made with felt. Totally handsewn, not a machine in site! Didn't think it would stand up to my usual wear and tear on my handbags, but thought it could be good to store embellishments or embroidery threads. This one is the prototype, just a few adjustments to make and I am on my way to make more! Oh yeah, I have to give credit for the design to a stationery set of my daughters, it gave me the idea to recreate it in felt.